The issue of "Internet everywhere/jurisdiction anywhere"
Privacy issues, including the use of Web crawlers, spyware, adware and "spam"
The Guide continuously updates proposed legislation, late-breaking cases and links to other Web sites with important information such as press releases and conference notices. (It also includes direct links to court cases, laws, regulations and source documents relating to e-commerce, privacy, security, trademarks, copyrights, contracts, licensing, jurisdiction, advertising spam, and more!) 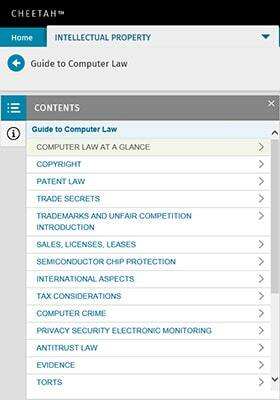 And the Guide to Computer Law offers full text laws and court decisions as well as authoritative explanations and annotations provided by our expert editorial team.